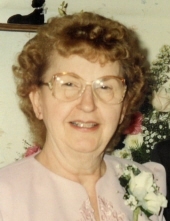 Elizabeth Laser, 92, of Mansfield passed away January 9, 2019 at OhioHealth Mansfield Hospital after an extended illness. Elizabeth was born April 18, 1926 in Philadelphia, Pennsylvania to John and Gertrude Miller. She was married to her husband, Harry Laser for 67 years until he passed away in 2011. Elizabeth worked at Hartman Electric and Westinghouse and then became a stay at home mom. She was a member of St. Peter's Catholic Church and enjoyed gardening, reading, and especially shopping. Survivors include her children Darryl Laser, Carol (Dale) Smith; numerous nieces and nephews. A graveside service will be held Friday, January 18, 2019 at 11:00am with Fr. Austin Ammanniti officiating. To send flowers or a remembrance gift to the family of Elizabeth M. Laser, please visit our Tribute Store. "Email Address" would like to share the life celebration of Elizabeth M. Laser. Click on the "link" to go to share a favorite memory or leave a condolence message for the family.